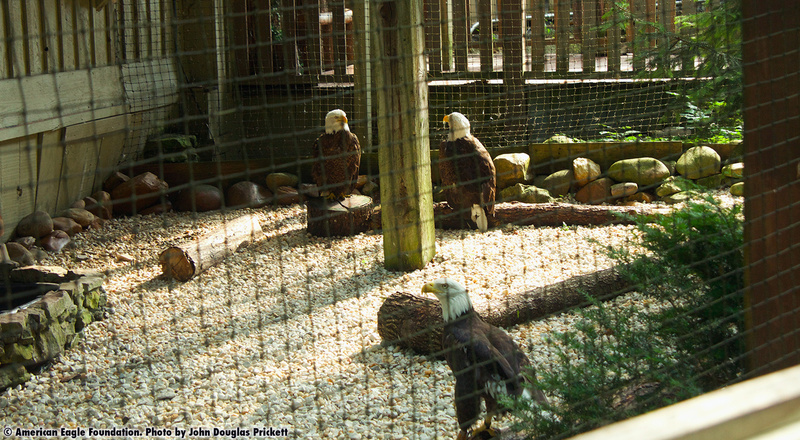 The smallest enclosure is located on level ground separate from the main exhibit, and Eagles who have little to no flight ability (such as wing amputations) live in this enclosure, which is partially landscaped for ease of movement. Low perches are also available for the eagles. Many of our Bald Eagle breeding pairs throughout the years have resulted from two Eagles from the PAM section and the Lower Level section choosing each other as mates, at which point they are given their own private enclosure with the hope that they will reproduce and raise Eaglets that will be released into the wild. “Brave Spirit” is a male Bald Eagle. He was found in Gulf County, Florida in March, 30 2006 by two state biologists who were performing fauna surveys. He was taken to the local wildlife rehabilitator, where it was discovered he had been shot in his wing and he had compound fractures of both bones above the elbow The wing could not be saved and was amputated at the elbow. This Eagle recovered after his surgery and rehabilitation, and was given the name Brave Spirit because of his determination and will to live. Not only did he overcome his injuries, he overcame a depression that commonly accompanies birds of prey when they experience a serious injury. It is inconceivable how anyone could shoot one of these beautiful birds. Brave Spirit now resides at the American Eagle Foundation’s “Eagle Mountain Sanctuary” at Dollywood entertainment park in Pigeon Forge, TN. His presence reminds everyone to do all we can to protect and conserve this majestic species. “Troy” was found near a fishing access road in North Norwich, New York. He had a cataract in his right eye and injured right wing. Despite attempts to rehabilitate him, his wing injury was severe enough to render him flightless. He was transferred to the American Eagle Foundation to live permanently in Eagle Mountain Sanctuary.